The vineyard spans over 118 communes in the Eastern Pyrenees and covers 12 000 acres. It is a vast amphitheater limited on the East by the Mediterranean, by the Albères mountain range and Spain on the South, the foothills of the Canigou on the West and the Corbières on the North. This territory is crossed by 3 rivers – the Agly, the Têt and the Tech – which have carved the land into hills and stacked terraces. The Côtes du Roussillon Les Aspres were granted an AOP of their own in 2003 and became Côtes du Roussillon Villages Les Aspres in 2017 (valid for 2015 vintage and following). Rosé and red wines: Black Carignan, Black Grenache, Lladoner Pelut, Cinsault, Syrah, Mourvèdre. Macabeu and grey Grenache (for rosés only). Black Carignan, Black Grenache, Syrah, Mourvèdre only for Côtes du Roussillon Les Aspres. White wines: white and grey Grenache, Macabeu, Tourbat or Malvoisie du Roussillon, Roussanne, Marsanne, Vermentino. Sandy granite and gneiss, with dark schist in the Fenouillèdes mountain range to the NorthWest. Red clay limestone in the Corbières foothills, sandy clay conglomerate in the Aspres and rocky terraces along the rivers, gneiss and siliceous clay hillsides of the Albères. Altitude from 0 to 250 meters. 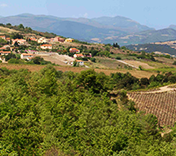 Côtes du Roussillon les Aspres are produced from selected parcels of land with fine, gravel soils. Deeply rooted in their one thousand year old history, Côtes du Roussillon wines draw their richness from the region, a fiery red land. They embody the region’s vibrant colors with their red, rosé and white palette. Côtes du Roussillon Reds are wines that are corpulent, fruity and spicy. The Côtes du Roussillon Les Aspres are elegant wines with wild and spicy notes that age very well. 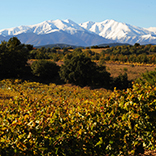 Côtes du Roussillon Whites are delicate and elegant wines, with notes of citrus, white-fleshed fruit and flowers. Clinging to the steep Northern slopes of the hills, forming the higher rows of the amphitheater and stretching along the winding Agly river, the 4600-acre vineyards cover 32 communes, including Latour de France, Caramany, Lesquerde and Tautavel. Red wines only. At least 2 varietals among Black Carignan, Black Grenache, Lladoner Pelut, Syrah, Mourvèdre, the most important of which should be ≤ 70 %. Côtes du Roussillon Villages Caramany, Lesquerde, Latour de France, Tautavel and Les Aspres each follow specific rules. All the terroirs of Roussillon, including among others: granitic and gneissic sandy soil, brown and black schist in the Fenouillèdes mountains in the North-Western part of the department. Red clay-limestone soil and limestone in the foothills of the Corbières. Rocky terraces on the left bank of the Têt. Altitude between 100 et 400 meters. Côtes du Roussillon Villages Lesquerde: vast plateau at 320 meters above sea level, on average, on sandy granitic and gneiss soils that contains a lot of iron and gypsum. No mourvèdre in this AOP. Powerful and complex wines, Côtes du Roussillon Villages are suitable for ageing. Côtes du Roussillon Villages Caramany are supple, fresh and full-bodied, meant to be drunk young, as well as concentrated wines, with notes of crushed, dark fruit, strong spices and a very marked taste of the garrigue linked to its terroir. Côtes du Roussillon Villages Lesquerde are very sophisticated wines marked by notes of minerals, graphite, spices and flowers. A terroir of garrigue and schist confers notes of wildness, minerals and sweet spices to Côtes du Roussillon Villages Latour de France. Red soil makes these wines complex and suitable for keeping. Côtes du Roussillon Villages Tautavel are wines with strong, complex and persistent tannins characterized by notes of dark fruit, garrigue and spices. Wines for ageing. 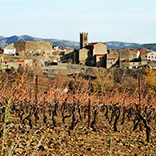 Côtes du Roussillon Villages Les Aspres: elegant wines with wild and spicy notes. Wines for ageing. Planted between the Mediterranean Sea and the Pyrénées mountains, this small vineyard of about 1200 acres, gathers the villages of Collioure, Port-Vendres, Banyuls-sur-Mer and Cerbère. AOP Collioure wines can be White, Rosé or Red, made with at least 2 grape varieties. Black Grenache, Syrah and Mourvèdre are occasionally complemented by Carignan, Cinsault and Grey Grenache in red and rosé Collioure wines. Old White and Grey Grenache hold sway for the whites (constituting at least 70% of the blend); with the occasional addition of Malvoisie, Macabeu, Vermentino, Marsanne and Roussanne. AOP Collioure vines grow on a balcony of grey schist from the primary (Cambrian) era that overlooks the Mediterranean. Ravines and hills alternate with each other, and the vines are established on very narrow terraces. The combination of these unique soils, intense sunlight and the sea makes for a very special micro-climate for this Appellation. Collioure Red: range from ample, fresh and fruity wines, alive with notes of pit-fruit and the air of the sea, to rich and complex wines with the aroma of spices and ripening fruit. Collioure Rosé: fresh, strong wines, with complex notes of small, red fruit and minerals. Collioure White: rich wines, intense, with notes of flower, aniseed and minerals. 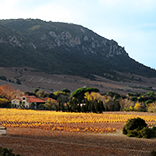 The Maury appellation, until recently reserved for Vins Doux Naturels, was created with the 2011 harvest for dry wines produced from the same terroir (around 700 acres). Maury sec are exclusively red wines, mainly produced from Black Grenache (2 varietals at least). Black Carignan, Mourvèdre and Syrah are common complements. The Lladoner Pelut more rarely enters in the composition of these wines. The Maury vineyard spreads across hills of schist and black marl on slopes encircled by garrigue. Dark, rich, strong and very flavorful, Dry Maury wines are notable for their notes of dark fruit combined with garrigue. They are distinguished in the mouth by their full body and tannin robe encouraged by a minimal period of maturation. Good structure and balance ensure very good ageing. IGP Côtes Catalanes wines are produced from about 10,400 acres of vines planted in 118 communes in the department of the Eastern Pyrenees. IGP Côte Vermeille wines are produced in Banyuls-sur-Mer, Cerbère, Collioure, Port-Vendres on a vineyard of about 20 acres. Red and rosé wines: mainly Black Grenache, black Carignan, Cinsault, Lladoner Pelut, Mourvèdre, Syrah, Merlot, Cabernet Sauvignon, Cabernet Franc, Chenanson, Marselan. White wines : mainly white and grey Grenaches, Macabeu, Malvoisie du Roussillon, Marsanne, Roussanne, Vermentino, Muscat d’Alexandrie, Muscat petis grains, Chardonnay, white Sauvignon and Viognier. Varied terroirs: IGP Côtes Catalanes grow all over the Eastern Pyrenees. 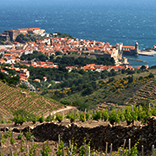 Côte Vermeille vines grow on terraced slopes facing the sea, between Collioure and Cerbere. Soil is grey schist of the Cambrian period. IGP Côtes Catalanes red: light, drinkable or full-bodied strong wines, they often fully reflect the main characteristics of the grapes from which they come. IGP Côtes Catalanes rosés: fresh wines with echoes of small red fruit and flowers. IGP Côte Vermeille red: light, easy-to-drink wines. IGP Côte Vermeille rosés : light, fresh wines. IGP Côte Vermeille whites: full, fresh wines. Wines carrying the mention “rancio “, white or red at the start, end up in time, with a dark amber colour, sometimes walnut-coloured with bronze accents, and offer typical notes of dried fruit (nuts, almonds…). IGP Côte Vermeille rosés : light, fresh wines. IGP Côte Vermeille whites: full, fresh wines.